1. Confirming that the startup can take stockholder action by written consent without a meeting: More often than not, it would be a waste of time to call a formal stockholder meeting when the initial founders can simply sign a written consent to approve any matters that require stockholder approval. Therefore, it is important to make sure that the stockholders can approve matters “by written consent without a meeting.” In every day terms, that simply means the stockholders sign a document and it’s approved. No meeting required. Generally, the stockholder written consent must be approved by the same number of votes as would be required at an in-person stockholder meeting. Most matters only require a 51% approval. 2. Confirming that the startup can take board action by written consent without a meeting: The principle is the same as the stockholder action by written consent. It is less time-consuming and more efficient to have the board members approve a stock issuance or a material contract with a written board consent instead of an in-person board meeting. A board action by written consent must be unanimous. SPEEDBUMP: It is very important to notice that a written board consent requires a unanimous approval (i.e. all board members must sign). However, a stockholder action by written consent only usually requires a majority (i.e. the number of votes as would otherwise be required in an in-person stockholder meeting). 3. Roles of Officers: It is important to review the description of the responsibilities and powers of the principal officers of the corporation. 4. Number of Directors: The bylaws should have a provision regarding the number of directors. However, I usually set up most of my startups’ bylaws with a provision that gives the board the right to set the number of members of the Board of Directors. For example — “The authorized number of directors shall be determined from time to time by resolution of the Board, provided that the Board shall consist of at least one member.” If the bylaws, have an actual number of members of the Board of Directors, make sure the number is currently accurate. 5. Notice by Electronic Transmission. I’m all for doing things as simply as possible, and avoiding the need to print, stuff envelopes, pay for postage and rely on the USPS to deliver on time. Therefore, I like having a “Notice by Electronic Transmission” to be included in the bylaws. There are restrictions to the use of electronic transmission but it can often be a very efficient method to provide notice. 6. Amendment. There will come a time when the bylaws have to be amended. It is very important to always know what it will take to change the bylaws. 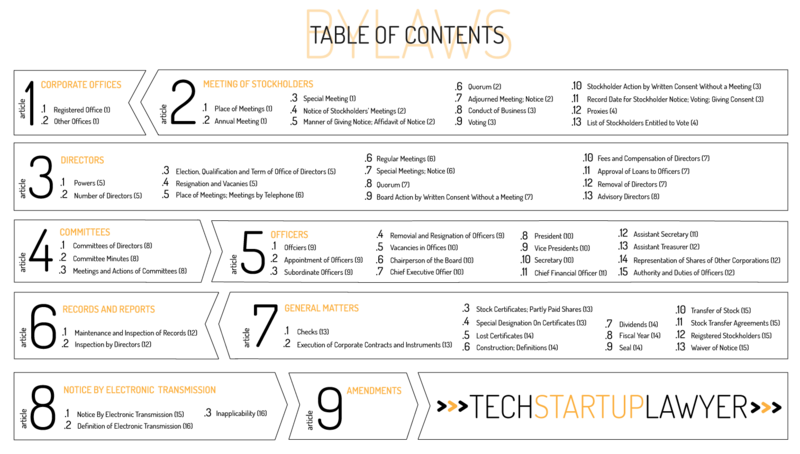 To give you a better idea of the structure of the bylaws, below is a typical table of contents for the bylaws of a technology startup. CLICK HERE to download a PDF version of the table of contents for the Bylaws. 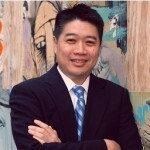 Sam is a partner with Innovation Capital Law Group and specializes in startup representation, corporate finance (i.e. angel investment and venture capital financings), mergers and acquisitions and licensing transactions.